Brasov, Romania – 16/7/2010 | Camperissimo! 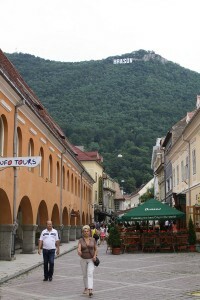 After we woke up, we realised that David and Oihana had already left for Brasov. The previous night we decided to meet up with them again, but we also made plans to meet Simona and Alex who we contacted through Couchsurfing a couple of weeks before leaving for our trip. Driving towards Brasov, we noticed and interesting old castle (Rupea) at the top of the hill so we stopped there to check it out. It was closed for the public because they were renovating it at the moment, but they let us come in anyway. The view from the castle was amazing and it was really cool to be the only people walking around the ruins. After a photo shoot, we continued driving towards Brasov. While Jay was driving around the town, unsuccessfully trying to find a good place to park, I contacted Alex and Simona to let them know what’s going on. Alex offered to come to the centre and meet us there, but we told him we’ll just give them a call once we park. We were still driving around when a motorcycle pulled up in front of us at the traffic lights. Jay said: What is this joker doing?! but when he took his helmet off, I recognized from the photo that it was Alex! He was driving around the town and eventually managed to find us! We were hesitant at first when he offered that we could follow him to their apartment and sleep around there, but then he mentioned they had a washing machine and there was no doubt left any more. At that moment we had a huge bag full of dirty, smelly clothes in the roof box and we were really excited about washing them. Also, the idea of taking a proper shower (the one at the petrol station outside Cluj doesn’t count because the bathroom was really disgusting) really made me happy. After chatting to Alex for a bit, drawing him a tree for their collection, showering and washing the laundry, we jumped on our bikes and rode into town. We met David and Oihana later for a few drinks and then all of us met Simona, Alex and Alex’s German teacher for dinner. We all made plans to meet the next morning at 8.30 for a camper van breakfast. Woohoo! 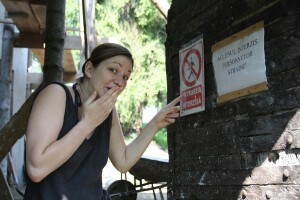 This entry was posted in Camper Trip July 2010 and tagged 2010, Brasov, diary, german teacher, laundry, Romania, Rupea. Bookmark the permalink.